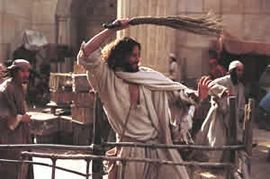 What do you think of Jesus’ reaction to the money changers and merchants? He was pretty mad – almost out of control. Why? Because destructive elements were allowed to corrupt something very important to him – his Father’s house. Both the money changers and the merchants exploited people. They took advantage of people’s situations for their gain. Sometimes people were kept from worshiping God because they could not afford the usury fees. In other words, they defiled the Great Commandment (loving others and worshiping God). Today, Jesus is still very concerned about his Father’s house. Only his Father’s house is no longer located in Jerusalem. It is in your heart, your life, your being (1 Cor. 3:16). What destructive elements are allowed to exist in the Temple of your heart? Greed, anger, revenge, lack of mercy, gossip, strife, bitterness, and blind ambition keep you from loving others. Pride, busyness, duplicity, personal agendas and love of the world keep you from worshiping God. Jesus invites you to ruthlessly “turn over the tables” in God’s house – your heart. With the Spirit’s help, transform your heart from a robber’s den to a place where worshiping God and loving people flows freely. List any improper attitudes and/or motives that are uncovered. Ask the Spirit for help in changing.